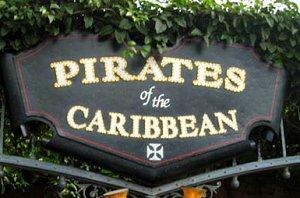 The Pirates of the Caribbean Disneyland ride is a classic attraction that has been drawing crowds for over forty years. Next time you are at the Disneyland Resort, be sure to visit this pirates' lair full of Disney excellence. The original vision for Pirates of the Caribbean at Disneyland was drastically different from the ride you see today. Walt Disney began to develop the idea in the late 1950s. He intended for the ride to be a walk-through wax museum, showing scenes of pirates in situations from actual history. Due to the realization that the wax museum would cause crowding and back ups on busy days, Disney's Imagineers instead designed the attraction as a boat ride where guests would float past these scenes. It opened at the 1964-1965 World's Fair in New York before settling at its permanent residence in the New Orleans Square area of the Disneyland Resort. Using Disney's innovative audio animatronic technology, the ride was a hit from the start. The Pirates of the Caribbean Disneyland ride is the final attraction Walt Disney had input on before his death in 1966. For this reason, many Disneyland enthusiasts cherish this ride and herald it as a legendary classic within the Disney theme parks. Once you board your boat, you cruise through various adventures featuring pirates, plundering, and some good old-fashioned plummets down waterfalls. These drops are mild (the largest is 18 feet), however they take place in complete darkness which may be frightening for some riders. The Pirates of the Caribbean Disneyland ride is 14.5 minutes long, giving you plenty of time to enjoy the scenes featuring cannon blasts from boats, burning villages, a gorgeous treasure room filled with gold, and pirate prisoners attempting their escape. 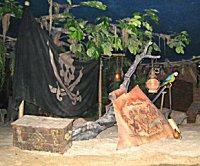 A recent update to the ride includes animatronics of Captain Jack Sparrow and other characters from the recent movie trilogy that has met immeasurable popularity with the public. These enhancements have caused Pirates of the Caribbean to experience longer lines and a higher demand than it has in years. During peak seasons (Christmas and summertime), Disneyland utilizes the "fast pass" system for this ride, which allows you to make a "reservation" time to return to the ride where you can wait in a significantly shorter line. Riding this attraction at night adds to the atmosphere, as the entire ride itself is immersed in the dark and features lurking pirates and scenery only impressive against the night sky façade. If you choose to ride during the real world's nighttime, you will often find a much shorter line. This is due to the fact that getting wet on Pirates of the Caribbean is a standard expectation. With the large drops and water bombs rigged inside to simulate cannons hitting the "ocean," you will exit your boat in a condition ranging anywhere from mildly damp to completely soaked. Crowds are also usually reduced during Disneyland's showings of Fantasmic! and the Fireworks Spectacular. During Fantasmic!, there is usually an overwhelming crowd against the Rivers of America in anticipation for this aquatic stage show. For the fireworks, families head over to Sleeping Beauty's Castle and Main Street U.S.A. for the best views. This gives you a prime opportunity to ride Pirates of the Caribbean without having to wait in a long line. If you are craving a little nighttime romance during the day, consider making a reservation at the Blue Bayou restaurant. A fine dining destination located inside of the Pirates of the Caribbean attraction, you can watch the boats glide quietly past the "bayou river" before they drop down below the first waterfall. Likewise, riders can wave to dinner guests dining on filet mignon and Monte Cristo sandwiches as they sail past. The wild popularity of the Pirates of the Caribbean Disneyland ride shows that Walt Disney invested a lot of effort into creating theme park experiences that would carry over to several generations. Many baby boomers are now riding this attraction with their grandchildren, experiencing it through the eyes of a child once again. While the Disneyland Resort continues to feature more thrilling rides to meet public demand, the public has also continuously shown its support for a Disney classic which we can expect to stick around for many decades to come.